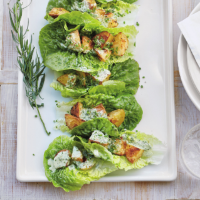 These little lettuce leaf 'scoops' hold hot, spicy potatoes and a herby dressing. Preheat the oven to 200°C, gas mark 6. Mix the rub with the rapeseed oil. Cut the potatoes into chunks and toss with the spicy oil in a roasting tin. Cook for 30 minutes until golden, crisp and tender. Meanwhile, place all the dressing ingredients with 50ml cold water into a small food processor and blitz until smooth. Spoon the hot potatoes into the lettuce leaves, drizzle the dressing over, then sprinkle with the chives and serve. This recipe was first published in Wed May 20 17:05:00 BST 2015.